Seasoned mushroom stems, which uses olive oil, honey and garum, along with lovage as a seasoning for mushroom stems. The Romans used this method to cook large wild medow mushrooms; it is also good for both boletus and cultivated mushrooms. Original recipe: Tirsos eorum concisos in patellam novam perfundis, addito pipere, ligustico, modico melle; liquamine temperabis; oleum modice. 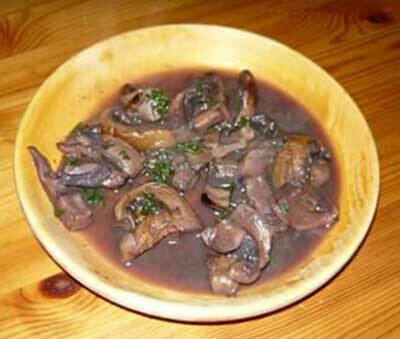 Translation: Another recipe for mushrooms: Put the chopped stems in a clean pan, add pepper, lovage, and a bit of honey; mix with garum; [add] a bit of oil. Finely chop the lovage or parsley. Cut the stems into small pieces and sauté in a pan with the olive oil, pepper, lovage (or parsley), honey, and garum. [Naturally, you can use the entire mushroom for better flaver.